Lhakar Diaries was created to honor the Lhakar movement, a non-violent, non-cooperation movement of civil resistance happening inside Tibet. Lhakar, meaning ‘White Wednesday.’ It is a significant day to Tibetans as it is the day the Dalai Lama was born, known as his ‘soul day.’ It is a single day out of the week ordinary men and women actively resist China’s occupation by supporting Tibetan businesses, eat Tibetan food, wear Tibetan clothing, speak Tibetan language and celebrate the Tibetan identity. Lhakar is about celebrating Tibetan culture and engaging in civil resistance. Such acts of resistance are clear examples of the resolve of the Tibetan people and are clear signs of the next phase of the Tibetan freedom struggle. This blog was created in order for young Tibetans on the outside to stand in solidarity with Tibetans fighting for the survival of their nation and identity. We are a team of young Tibetans around the globe, highlighting these examples of civil resistance inside Tibet. 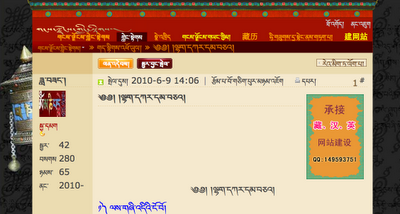 Our blog serves as a platform to promote similar actions on the outside, showing our solidarity with Tibetans in Tibet. In this spirit, Lhakar Diaries publishes posts from our contributors all around the world, and encourage young Tibetans out there to share their writing, music, art, anything that contributes to exploration and empowerment of the Tibetan identity. We also hope this space will be used to demystify ideas about Tibet and bust stereotypes of Tibetan people. Although we want to make Lhakar Diaries a platform for the voices of Tibetans, we welcome supporters (allies) to send us urgent posts if and when a Tibetan voice cannot reach us. For example, see “The Voice of Tawu” in which Gabrielle served as a medium to bring us “The Voice of Tawu” in the form of an anonymous interview. The emphasis must always be the voice of Tibetans themselves. This modest movement called Lhakar comes from the fact that I am Tibetan, and it is like a note reminding us that we are Tibetan in our daily life. Through this movement, we restore, renovate and keep our language, culture, identity and tradition. Through this technique we can keep the people of the Snowland’s soul language till the end of humankind. This technique helps us retain Tibetan culture, Tibetan good morals and the traditions which are born from our soul language. This technique is easy and it is meaningful. This Lhakar movement began in anticipation as remedial medicine for hundreds of diseases for Tibetan brothers and sisters who live in every region. I hope that many Tibetan brothers and sisters will participate in this movement without any invitation and follow the eight promises or keep even one of them, and practice it. I am requesting all Tibetans to keep this pledge as I kneel down on my knees and humbly fold my hands on my chest, and make this request innumerable times. I am Tibetan, from today I will speak pure Tibetan in my family. I am Tibetan, from today I will speak pure Tibetan whenever I meet a Tibetan. I am Tibetan, from today I will remind myself every day that I am a Tibetan till I die. I am Tibetan, from today I will wear only Tibetan traditional dress, chuba, every Wednesday. I am Tibetan, from today I will speak only Tibetan every Wednesday. I am Tibetan, from today I will learn Tibetan language. I am Tibetan, from today I will stop eating meat and only eat a vegetarian diet and gain more merit every Wednesday. I am moved and I want to bless you all as you endeavor to keep your traditions and each other ‘alive’. I personally have great compassion and strive to understand the situation in Tibet and how her people have survived. Please know you have a friend who is interested and cares deeply for what happens to the Tibetan culture. Thank you Cindy! Thanks for reading and thanks for sharing your thoughts. None of us can tell who is lie who is not, u r considering peploe in Tibet, I am considering the peploe as well, what can bring them a better life?what they want?Peace and development.Don’t talk about the human rights so loud here, think about what the western done in middle east first!!! Also, does the Tibet issue really have a matter to the Olympic? Stop it then what can those Chinese get for all their effort? Do u know how many ppl r expeccting the Beijing2008? Who will stand out for them? we don’t know politics, we just want peace and a success Olympic, why we can’t stay where we r and do our own stuff instead of creating a new war in words? Why the media trying to fool plpoee so hard at this time? Anyone think about that? Why the issue of Tibet will be put on so high profile at this time? If u r just a bit smart, u should realize what’s going on, it all about jealous of the increasing power of China, if anyone want to talk about the human right, look back ur own country, do u really know ur own government well? Think about the majority Chinese, talk about the human right for them first, and see what influence u will bring to them!!! Because the media has a right to expose the truth information to the worldwide. And better uh also try to learn something about china and their policy,government.. Translation: Hello Friends! Wouldn’t it be better if we all try to write something in Tibetan, keeping in mind the Lhakar Movement and our other endeavours on Lhakar Wednesdays no matter how small and insignificant it maybe? Wouldn’t it be more useful to better your Tibetan and therefore culture this way? Just a passing thought. i owe to lhakar movement and there enormous emphasised over preserving and practising tibetan tradition and culture.these are the basic elements and duty of alll the tibetan diaspora for being a tibetan nationality. lhakar movement is indeed a profound blog to all tibetans and specially for tibetan youngster grew up in abroad lacking in tibetan knowledge..bod gyalo and we are with you..
You guys and gals rock! Love the entries and the spirit that moves you to share your lives! These are very trying times for the planet; thank you for affirming life’s more courageous dimensions! It is so inspiring to read and informs all my social justice and dharma work as well! In Faith and Solidarity from CA! thankyou very much for bringing tibetan youths close and i appreciate the work you guys have done. I hope and pray that it happens in my lifetime….